What are some of the most common benefits of a chemical peel? Chemical peel involves the careful application of a chemical exfoliant to the epidermal skin specifically for the removal of superficial lesions and blemishes and thus to improve the texture of the skin. Various acids and basic chemical agents have been used for this purpose. The nature of the compound, the concentration of the chemical and the level of time it is in skin contact will determine the level of skin penetration and the level of peeling. At Belvista Medics we only recommend light and medium peels as these are safe and require no down time. All chemical peels involve applying a chemical solution to remove the outer layers of skin so that a smoother, more evenly pigmented, glowing layer of skin can appear. There are two basic categories of chemical peels. Each type works differently, and produces different results. The choice of peel will be determined by the clinician and the patient. In general, the stronger the chemical, the deeper the peel, and the more impressive the results. However, the deeper the peel, the more pain the patient is likely to experience and the recovery time will be longer than for a light peel. Our newest most innovative peel. The Perfect peel is a synergistic blend of 6 acids, vitamins, mineral and the mother of all antioxidants- Glutathione. 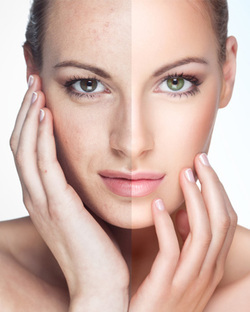 Light or “lunch hour” peels are the mildest of the chemical peels. These peels include glycolic, lactic, and fruit acid peels (AHA) or Salicylic Acid (BHA). They burn off only the outer layers of the skin to smooth out fine wrinkles and/or rough, dry skin. AHA (Glycolic Acid) peels may also be used to improve the texture of sun-damaged skin, balance out skin pigmentation, or diminish some types of acne scars. These peels are often repeated to achieve the desired results. The TCA solution is used for medium depth peels. This is generally used to treat skin with moderate sun damage, surface wrinkles, and/or uneven tone or pigment abnormalities. AHA and TCA peels for the full face generally take 10 - 15 minutes. The entire procedure takes approximately 1/2 hour. During the procedure, most people feel a burning sensation, followed by a feeling of numbness or stinging. The sensation will vary depending on the type of peel. If it becomes too uncomfortable then it can be neutralised immediately. Do I need to take time off work to have a peel? It is not necessary to take time off work but your skin may appear a bit red just after the peel. Patients are advised not to use any make-up for 24 hours if possible. Can I sunbathe after a peel? Redness, itching, swelling, allergic reactions to the products, hyper pigmentation or hypo pigmentation, and dryness of the skin may occur. There is a small risk of developing a temporary or permanent colour change, scarring, and reactivation of cold sores. Most of these complications are preventable and can be effectively managed. Are there any reasons I can’t have a Peel? If you are pregnant, breast feeding, or have had chemo/radiotherapy, dermabrasion or roaccutane treatment in the last 6 months, peels are not recommended.